Classcom's Comic Strip Art captures the humorous and meaningful messages spoken by the most well known comic characters. 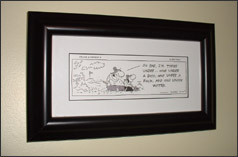 Our line comic strip art includes themes and subjects to fit all tastes, situations, hobbies and occupations. 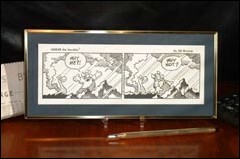 Select and Signature Editions makes Comic Strip Art a collectible item. Our art is a humorous and unique was to decorate a home or office. Please note that the Desk Art and Fun Frame catalogs are identical. Measures 4" X 8.75" and is professionally mounted on an acid free mat. Each piece is embossed with an authenticating seal and edition sizes are limited to 5000 pieces. Desk Art is packaged in a gift box and contains a lucite desk stand making it perfect for an office desk, mantel or any display area. 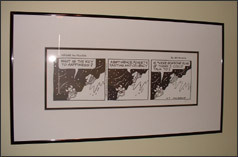 Measures 7.5" X 12.5" framed and is professionally mounted on an acid free mat. Each piece is embossed with an authenticating seal and edition sizes are limited to 5000 pieces. Fun Frames are packaged in a gift box and are ready to hang. 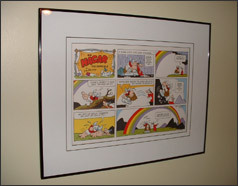 Measures 12" X 22" framed (approximate image size 4.5" X 14.5") and is professionally framed and mounted on an acid free mat. Select editions are limited to 950 pieces and embossed with seal of authenticity. Signed editions are limited to 450 pieces and signed by the artist. Frames are ready to hang. Measures 20" X 24" framed (approximate image size 11" X 15.5") and is professionally framed and mounted on an acid free mat. Sunday strips are in full color. Select editions are limited to 950 pieces and embossed with seal of authenticity. Signed editions are limited to 450 pieces and signed by the artist. Frames are ready to hang.